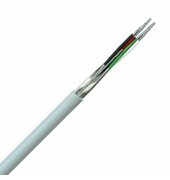 Used in the security industry for CCTV applications including telemetry. Also suitable for application where it is important to provide high level of screening from external source with low levels of cross talk between pair like computer and instrumentation applications. Low Smoke Zero Halogen versions are also available. Materials for insulation and sheath can be replace with those that do not emit halogens and toxic smoke. Individually Screened: Tinned copper conductor 22(7) AWG 0,35mm2, polypropylene insulation, red/black & green/white conductors, twisted into pairs, each pair aluminium / polyester foil screened, common tinned copper drain wire (24AWG), PVC sheath. The duct grade version has a black polyethylene sheath, while the armoured version is protected by heavy galvanized steel wires and an external grade sheath. Individually and Overall Screened: Tinned copper conductor 22(7) AWG 0,35mm2, polypropylene insulation, twisted into pairs, colour code red/black & green/white, each pair individually screened with aluminium / polyester foil and 24AWG tinned copper drain wire, overall aluminium / polyester foil and 24AWG tinned copper drain wire, PVC sheath.